ALAMEDA, Calif. -- The Raiders will play at the Oakland Coliseum this season, and possibly in 2020, after acrimonious negotiations finally led to vote by the Coliseum Commission and an agreement on a lease Friday. The deal has been approved unanimously by the Oakland Alameda County Coliseum Stadium Authority board but still needs approval from the Oakland City Council and the Alameda County Board of Supervisors, which is considered a formality. As part of the agreement, the Raiders will pay $7.5 million in rent for the upcoming season, and should the team's $1.9 billion, 65,000-seat domed stadium in Las Vegas not be ready in time, they have the option to pay $10.5 million to return in 2020. The Raiders expect to be in Southern Nevada by then, though. The Coliseum Authority will also receive 100 percent of any money for naming rights after having split it 50-50 with the Raiders in the past. RingCentral had reportedly been in talks to name the Coliseum in January. A potential snag to the agreement arose late in the process, according to the San Francisco Chronicle, with an issue over the Raiders' Alameda practice facility and team headquarters, which had been deeded to the team as part of the $200 million stadium renovation when the team returned from a 13-season run in Los Angeles in 1995. "The Raiders were responsible for the estimated $525,000 in operating costs, taxes and debt payment on the facility," the Chronicle reported. "The Raiders had wanted the Coliseum to take back the facility now and assume its costs. The Coliseum Authority wanted the Raiders to cover the facility costs until the end of the new lease." According to the Chronicle, the Raiders have to pay an owed $750,000 in parking fees. Coliseum Authority executive director Scott McKibben told the Chronicle: "It's been agreed that the property comes back to us when the Raiders leave town and stop playing football at the Coliseum." The Raiders, who had their rent tripled after losing a vote to move to Los Angeles in 2016, initially took their one-year, $7.5 million lease offer off the table in December after the city of Oakland filed a federal lawsuit against the Raiders and the NFL over the team's move to Las Vegas. Raiders owner Mark Davis called the suit "meritless and malicious" at the time and said the team would keep all options open. But after considering joining the San Francisco 49ers at Levi's Stadium in Santa Clara and being blocked from playing in San Francisco at Oracle Park, the Giants' waterfront baseball park, all roads led back to Oakland and the Coliseum. The Raiders have called the Coliseum home from 1966 through 1981 and again since 1995. They played in 1960 and '61 at San Francisco's Kezar Stadium and Candlestick Park before moving to Frank Youell Field in Oakland in 1962. They played from 1982 to '94 at the Los Angeles Memorial Coliseum. The NFL had originally hoped to have an answer on the Raiders' home for 2019 by early February for scheduling purposes. The schedule is generally announced in mid-to-late April, before the draft. The Raiders will share the Coliseum again with baseball's Athletics. Open Sundays in September for potential Raiders games on the baseball dirt infield are on the 15th (the A's play a night game on Sept. 16) and the 29th (the regular-season home finale for the A's is the 22nd), with open Mondays on Sept. 9 (when the A's begin a seven-game road trip) and Sept. 23. The Raiders will again lose a home game to international play, as they will "host" Khalil Mack and the Chicago Bears in London. The team is also reportedly considering playing host to a preseason game at the home of the CFL's Saskatchewan Roughriders. Davis told ESPN.com in October that he wanted to play in Oakland one last season, even with the threat of a lawsuit looming. "Emotionally, I would say, why would I give them $3 [million], $4 [million], $5 million in rent that they're going to turn around and use to sue me?" Davis said at the time. "But at the same time, if they'll have us, I can't turn on the fans. I can't do it. And this is terrible negotiating I'm doing now. I'm going to get killed. But that's just the way I am. But if in fact it does get ugly and can't be bridged, we do have options." Raiders coach Jon Gruden made a point to celebrate the team's Christmas Eve win over the Denver Broncos last season with fans sitting in the Black Hole in the southern end zone. Raiders quarterback Derek Carr took a victory lap, slapping hands with fans. At the time, it was thought to be the last Raiders game at the Coliseum. "It's a real football stadium -- it's dirt, grass, it has tradition," Gruden said the week of 2018 season finale. "It's where some of the best games in the history of football have been played. It's where some of the best players in the history of the world played football games at. You're walking around before the Steeler game and you see Franco Harris and Lester Hayes and you think about some of the battles that they had at that place. "There's a lot of things that happened in that stadium. Next question; I don't want to start crying about a stadium." Carr, meanwhile, said he "loved" Oakland and spoke of "six dudes" who jumped the barrier in an effort to join him on his lap, before being tackled by security. "It is hard that it might be the last time, but if it is, it will always be there like, 'Man, what a time we have had there,'" he said then. 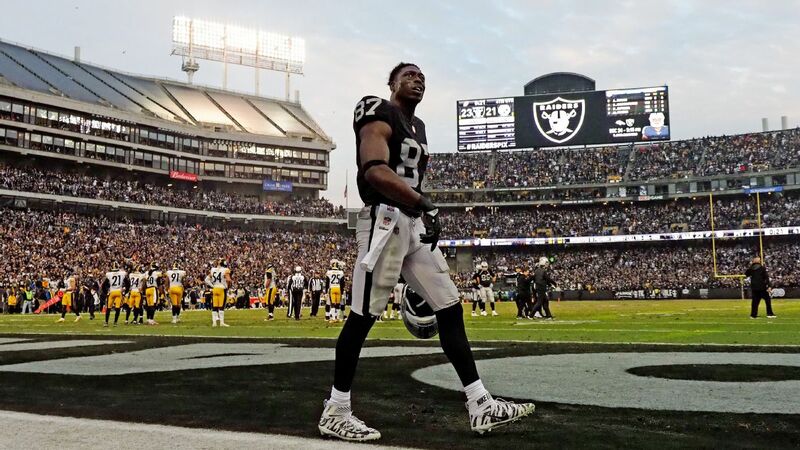 Carr, who suffered a season-ending broken right ankle in 2016 at the Coliseum, added: "We have had some tears of pain, joy and all those things ... we have the best fans in the world, the most loyal. "They were on fire. It's not the professional football atmosphere where everyone is in a tie and doing their thing. It is football, it is a rough and gritty place." And the Raiders' home for one last ride.